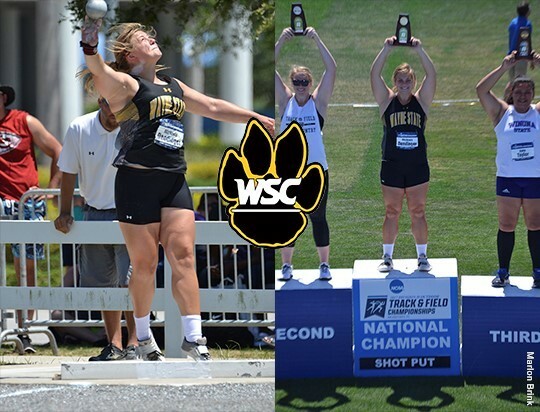 Wayne State College junior Michaela Dendinger capped a trio of All-American performances at the NCAA Division II Outdoor Track and Field Championships by winning the national championship in the shot put Saturday afternoon at the IMG Academy in Bradenton, Florida and hosted by the University of Tampa. Dendinger, a graduate of Hartington Public HS, set the tone for the event on her first throw in prelims unleashing an all-time best mark of 54' 9 ¼" to break the school record of 54' ½" set by Sara Wells at the 2015 NSIC Outdoor Championships (5/9/15). Other throws for Dendinger in the prelims included 52' 5 ¼" and 50' 7 ½". In the finals, she recorded throws of 54' 7 ½", 49' 9" and 53' 5 ½" to maintain her advantage of 1 foot and nine inches over second place Mel Herl of Chadron State. Dendinger posted four of the top five throws in the shot put at nationals and was the only athlete to record a mark of over 53 feet in the competition. Dendinger becomes the first ever three-time individual NCAA Division II All-American in WSC outdoor track and field history after placing second Thursday in the hammer throw (206' 1") sixth place in the discus on Friday to go with Saturday's national championship first place finish in the shot put. It's the second time that Dendinger has collected All-American honors in the shot put after placing seventh (49' 5 ¾") at the 2015 national meet. Wayne State finished the event with 21 team points, 12th overall in the team standings. It's the second highest ever finish for the Wildcat women's track and field program, trailing only the 2015 team that tied for eighth nationally with 26 points. The 12th place finish also marks the fourth time in the last five years that Wayne State College has finished in the top 20 in the NCAA Division II Outdoor Women's Track and Field Team standings. Story originally published on Wayne State Wildcat's website.